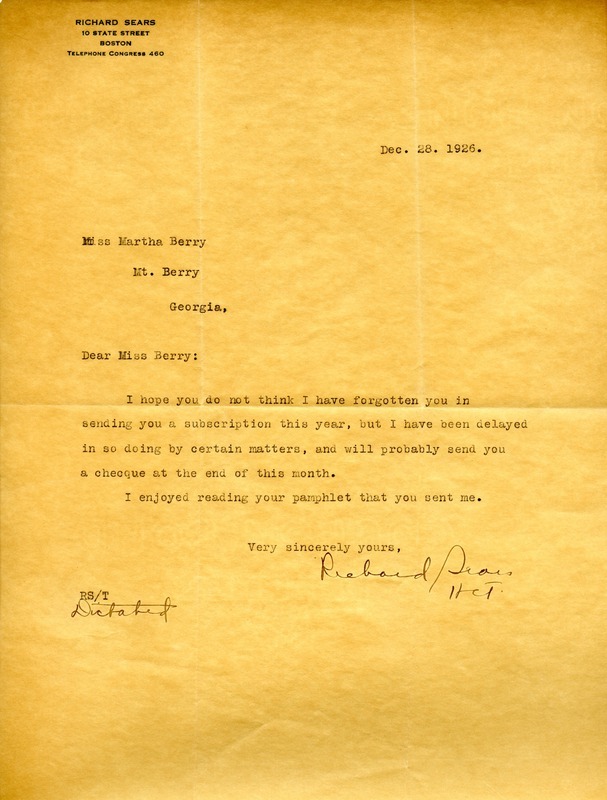 Letter to Martha Berry from Richard Sears informing her that he has not forgotten her in sending his subscription that year but informed her that he would probably send her a check at the end of the month. He also says that he enjoyed reading the pamphlet that she sent to him about the schools. Richard Sears, “Letter to Martha Berry from Richard Sears.” Martha Berry Digital Archive. Eds. Schlitz, Stephanie A., Jordan Brannen, Haley Fortune , et al. Mount Berry: Berry College, 2012. accessed April 21, 2019, https://mbda.berry.edu/items/show/2970.